Few of us were taught communication skills in school, yet poor communication brings so much disharmony, distress, and discouragement in our relationships. It can ruin your chance for success on the job or in your business as well. How would you honestly rate your communication skills? Do you experience a lot of drama, stress, and frustration after interpersonal communications at home or at work? If you do, this is something you can change. Communication skills can be learned. And when you learn how to communicate clearly and compassionately, your sense of confidence, ease, and happiness will increase at the same time. I’ve been on a campaign to improve my own communication skills over the last six months. I know I can be reactive, finish other people’s sentences, and jump to wrong conclusions. None of which leads to building trust, rapport, and deeper connection. My bi-monthly women's group offers the perfect opportunity to practice effective communication skills. We call each other out, in a kind way, if we slip away from using “I” statements. We practice paraphrasing what another person has said to be sure we’ve understood it. And, there’s a specific model in place for clearing negative thoughts and feelings. Now, I'm able to bring these skills into my everyday life. In fact, they're gradually becoming the automatic fall back. I'd like to give you a glimpse of what I've learned because it's helped me so much. I bet it could help you too. These 9 tips for improving interpersonal communication are simple. You may have heard them before. But the question is, do you use them? Have you mastered them? If not, read on. Be reminded and make a commitment to actually practice clear and compassionate communication. The use of “I” statements helps you to become aware of your own feelings, beliefs, and values and take responsibility for them. The more you employ “I” statements, the more you will come to know yourself and what’s most important to you. It’s a way to respect, empower, and stay true yourself. Often, we use “you” statements when we’re actually talking about our own thoughts and feelings. When you express through “you” statements, your true thoughts and feelings may get lost in the process. You’re always telling me what to do. “You” statements tend to close down communication, while “I” statements usually open it up. When you say, “I feel…,” be sure to follow it with a real feeling. The 5 core feelings are: happy, sad, glad, mad, afraid. They may vary depending upon who you ask, but this gives you the general idea. It's not easy to address delicate matters, but you'll find more success when you use real feelings. Listen attentively with the intention to understand rather than to respond, impose your own view, or offer your solution. Pay attention with your whole being: your heart, your mind, and all your senses. Show the person they have your attention by nodding, responding to the content with appropriate facial expressions, or expressing an “un-huh” from time-to-time. Learn to screen out external distractions and avoid getting carried away with your own internal dialogue. But don’t disregard your inner state altogether. It might provide important clues and intuitive information that will help you be more responsive. Never assume you fully understand the meaning of someone’s words. So many times we get it wrong, and our assumptions lead to discord. If you’ve misunderstood, you’ll receive clarification, which is essential to truly understand one another. Paraphrasing creates more space in the interaction, which can help slow things down so intense feelings don't take over. Genuinely seeking to understand in this way leads to greater trust and closer relationships. Interrupting says, “I’m more important to you. My opinion matters more than yours.” It won’t build trust or lead to closer communication. It’s more likely to make the person feel disempowered. Finishing another person’s sentence can interrupt their flow as well, and thus hinder the rhythm of the conversation. It again presupposes you know what they think better than they do, when in fact, it may only be indicative of your impatience. Interrupting or finishing sentences can make a person feel you’re not really there for them. They may even turn it against themselves and feel stupid. We all speak at a different speeds, and some people need more time to process. If you have a quick mind, you’ll need to slow down and match yourself to the other person’s pace. It’s a good opportunity to practice patience, a quality many of us need to develop. Most people want to solve their own problems. They feel more empowered when they do. If you feel you must solve other people’s problems, that’s something to look at in yourself, isn’t it? Trying to fix everyone and everything may mask a deep wound from your childhood. To explore this tendency further, read: Do You Feel Responsible for Everyone and Everything? As positive as your intention might be, feedback often feels like criticism to another person. Think of times when you received unsolicited feedback. How did it feel? Constructive feedback can help us grow. But let the other person request it. When they do, they’ll more likely be open to it. People often pause to get in touch with their feelings, to process their feelings, to check their understanding, or to get some space when they feel overloaded. Don’t feel like you need to fill up every gap with a response. If you do, you might impede another person’s internal process. Feel into the person to get a sense of what’s appropriate. If the silence is prolonged, inquire sensitively. You can ask what’s happening for them now, if the silence has a meaning, or if there’s anything he or she needs. Questions can feel like probing. Use them judiciously. "How would it feel if…"
"What are your tears saying?" Listening to others is important, but also listen to yourself too. If you begin to feel overwhelmed, spaced out, or barraged by strong emotions, ask to take a break. Tell the other person when you’ll be able to resume the conversation so they don’t feel abandoned or left hanging. Let them know they haven't done anything wrong, you’ve just lost your ability to be present for the moment. Communication is a skill you can learn, but you won’t master it overnight. So give yourself time. Take one of the skills above and practice it for an entire month before you move on to the next one. If you’re in a committed relationship, you could ask your partner to practice along with you. As much as you improve your communication skills, you'll still run up against people who seem impossible to communicate with. So keep your expectations realistic. Do all you can to communicate with clarity and compassion, but also know there may be times when you need the help of a therapist, mediator, or counselor. And there may be times when you need to walk away. What trips you up in interpersonal communication? What helps you to communicate clearly and compassionately? I would love to hear in the comments. 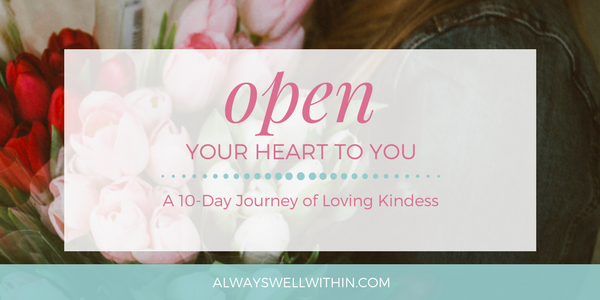 My updated Loving-Kindness course, Open Your Heart to You. I hope to have it ready for you sometime in March. Check out the details here.